Hello, Cybils book #1. I’ve heard loads about The Watcher since it came out this summer, so I was glad to finally pick it up. Unlike Me, Jane, which is a rather fictionalized version of Jane Goodall’s early life, this covers the majority of her life, starting with her interest in animals as a young girl and finishing with her activism for chimps in Africa. I find that so many biographies for young readers either leave out so much information that it’s hard to have any reference point for the information they do give or that it’s so complex that a second or third grader is going to be overwhelmed. This book neatly avoids both of those issues. I knew who Jane Goodall was and that she was famous for her work with chimps, but I knew very little beyond that. I didn’t realize how long it took her to get the chimps to even show themselves to her. I had no idea that she was the first person to realize that animals make and use tools. Like the best non-fiction picture books, this one made me want to know more. And the illustrations of perfect. They are a little bit simplistic, so they don’t detract from the story, but they are vibrant and full of color and life. I felt like I learned as much from the images as I did from the text. Especially when there were monkeys involved, I was sucked right into Jane’s story. 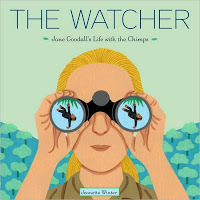 The Watcher is a phenomenal example of what a picture book biography can be. ooh, I love Jane G. Off to check if Spokane libraries have this one yet. Thanks for the review! Read Stargirl and the sequel, and I enjoyed them, but wasn't in love with them as were many in my bookclub. Forgive my forgetfulness, but you mentioned this book before, right? My sister interned for JG a few summers ago, and when I saw your post, I send the book to her, via amazon!